Chandra has provided evidence that our Milky Way Galaxy is embedded in an enormous halo of hot gas that extends for hundreds of thousands of light years. The mass of the halo is estimated to be comparable to the mass of all the stars in the Milky Way galaxy. If the size and mass of this gas halo is confirmed, it could be the solution to the "missing-baryon" problem for the Galaxy. This artist's illustration shows an enormous halo of hot gas (in blue) around the Milky Way galaxy. Also shown, to the lower left of the Milky Way, are the Small and Large Magellanic Clouds, two small neighboring galaxies (roll your mouse over the image for labels). The halo of gas is shown with a radius of about 300,000 light years, although it may extend significantly further. Data from NASA's Chandra X-ray Observatory was used to estimate that the mass of the halo is comparable to the mass of all the stars in the Milky Way galaxy. If the size and mass of this gas halo is confirmed, it could be the solution to the "missing-baryon" problem for the Galaxy. In a recent study, a team of five astronomers used data from Chandra, ESA's XMM-Newton, and Japan's Suzaku satellite to set limits on the temperature, extent and mass of the hot gas halo. Chandra observed eight bright X-ray sources located far beyond the Galaxy at distances of hundreds of millions of light years. The data revealed that X-rays from these distant sources are selectively absorbed by oxygen ions in the vicinity of the Galaxy. The nature of the absorption allowed the scientists to determine that the temperature of the absorbing halo is between 1 million and 2.5 million Kelvins. Other studies have shown that the Milky Way and other galaxies are embedded in warm gas, with temperatures between 100,000 and one million degrees, and there have been indications that a hotter component with a temperature greater than a million degrees is also present. This new research provides evidence that the mass in the hot gas halo enveloping the Milky Way is much greater than that of the warm gas. Thanks for your questions. The total mass of the Milky Way is estimated to be somewhere between about a trillion and three trillion times the mass of the Sun. An average density can be found by using reasonable values for the dimensions of the galaxy. Thanks for your questions. I leave this as an exercise: the density of the halo gas can be approximated by using the mass estimates given in the press release and dividing by the volume in a sphere with a radius of 300,000 light years. Estimates of the density of the solar corona and the interstellar medium can be found with judicious Google searches. Thanks for your question. The density of the gas in the halo can be approximated by using the mass estimates given in the press release and dividing by the volume in a sphere with a radius of 300,000 light years. The gas is very hot, but it's also extremely diffuse so the radiation it directly produces is weak. This method of looking for absorption by the hot gas seems to be effective. Thanks for your comment. It's important because it may be a significant part of the "normal" matter near our galaxy, and by analogy for other galaxies. But, more work is needed to make better estimates of the mass of the halo. I wonder if the mass of this halo is contemplated in the total mass of the visible matter in the universe. Am I the only one that, at first glance, thought ''hmmm, nice Oort cloud you got there, Milky Way.''? Lyman alpha "blobs" at >10G ly are clear indications of "early" Super Massive Black Holes [SMBH} seen blasting & illuminating their galactic hosts to radii ~350,000 ly. Lyman alpha blobs vacuum UV wavelengths reddened to IR allowing their visibility is from Hydrogen. Our MW halo absorption credited to Oxygen supports Supernova origin and genesis as blasted into the halo. A halo warmed by a feeding SMBH [quasar, AGN power-plant] could irradiate a MW halo episodically. 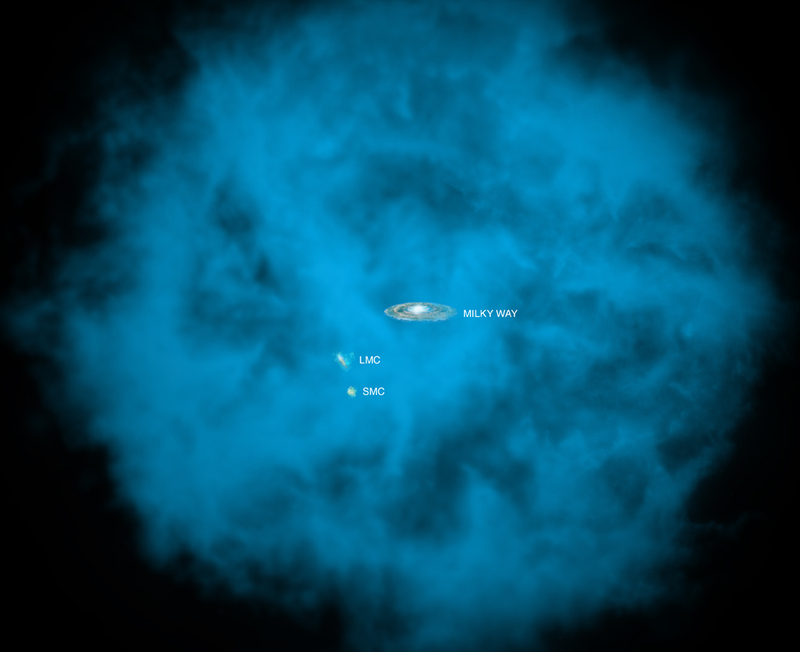 It would not be surprising if a small SMBH [i.e., Milky Way's heart] provided much energy to the halo while eating. I'm surprised there's not been more theoretical speculation about what this means for current theories of the standard model? Surely this undermines one of the needs for supersymmetry, dark matter, but if it's also this hot surely it would have been radiating em quanta and that would have shown up in our astronomical observations? I'm confused by this! If this halo so to speak is dark matter then what if it all comes together and Incases us in matter? Has anyone estimated the density of the hot gas? This gas and dust(?) is at what expected density? Please compare it to the density of the gas/dust in our Sun'd corona which is also stated to be millions of degrees Kelvin but of such a scarce density as you would not feel the heat. At least I have read such statements. I know not of their validity. Is this gas 300,00 LY from the MW center close to the same density as the interstellar gas inside the MW? Appreciate your answers. Many of your questions in the comments are being answered in this blog article http://www.chandra.si.edu/blog/node/399. After about 35 yrs, mans inventions have only reached the outer part of our solar system, which doesn't even feature in the scale of the image. The vastness of this bubble is mind-blowing. I am wondering if this gas is perhaps leftover from when our galaxy formed. If the M.W. has this halo - bubble, it stands to reason that other galaxies should have it also. Perhaps this is where a lot of the missing mass is placed. I wonder if Captain Kirk knew about this ? I think this shows how a narrow view of the cosmos can lead to poor assumptions. 20 yrs ago I-galactic space had1 atom/cu.m, now what else will we find ! Interesting finding. To what extent may the halo correlate to magnetic fields and to plasmas between galaxies? How exciting this news is! A great tribute to all the astronomers from Galileo to S. Chandrasekhar. The Halo of gas of 300,000 light years radius, I wonder could it be the missing dark matter? This is quite a revelation. That our milky way is engulf in hot gas. Please, keep it up. A fascinating, and in some ways comforting finding, possibly solving the baryonic issue. What is heating up all this interstellar matter to such high temperatures? Considering its vicinity, shouldn't it actually be only a few degrees above absolute zero? Also, maybe it's not really a halo but rather us looking from inside a pocket of empty space formed in the nebula from which our galaxy once coalesced. Are there any implications of this new data that could change how we look at Dark Matter or Dark Energy? So, Here are some dumb questions from a lay person... Is this the mysterious "dark matter" we have been looking for? Why is it so hot? Is "dark energy" simply Boyle's law on a cosmic scale? This is an outstanding discovery and a much nicer solution to the missing mass in the universe than the "dark matter" voodoo. Is the heating mechnism of that hot gas halo are the compact X-ray source objects or something else? I belive without heating it should have lost already since long time its energy via dissipative radiation. Awesome, so exciting information... thanks for your information. Go ahead, we are with you. This is very interesting, I am curious about how this cloud of gas is producing so much heat? How and where does the heat come from? Very interesting indeed! One question though, if we (our galaxy) are within a Halo of hot gas of very high temperature, why are the temperature beyond Earth's atmosphere, so low. Kindly explain. I have read somewhere on a NASA web page that our the Milky Way Galaxy is about 100,000 LY in diameter. If that is so, then the drawing above is not to scale. I count between 6 and 7 Milky Way diameters for the cloud's radius. Very exciting! Galactic rotation curves (velocity of rotation versus the distance from the galactic center) can not be explained by only the visible matter. The current best theory is that galaxies are composed largely of a roughly spherically symmetric halo of dark matter with the visible matter concentrated in a disc at the center. Can the observed rotation curves be fully accounted for by such a baryonic (not dark matter) halo of similar magnitude in other galaxies? This is a magnificent discovery. What I would like to ask is how this massive gas halo will effect the planet earth and sun during the winter soltice and when the planets are aligned with the Milky Way galaxy?